Dec. 18, 2018 – The Ottawa Humane Society and Municipal Animal Shelter will be closed some days during the holiday season. Closures include Christmas Day, Boxing Day and New Year’s Day. The OHS will be open from 10 a.m. to 5 p.m. on both Christmas Eve and New Year’s Eve. For a complete schedule, please visit the OHS website at www.ottawahumane.ca/about-us/contact-info/#holiday-hours. The Ottawa Humane Society is a registered charity founded in 1888. The society works in and with the community to provide leadership in the humane treatment of all animals, to address the causes of animal suffering, to encourage people to take responsibility for their animal companions, and to provide care for animals who are neglected, abused, exploited, stray, or homeless. Ensure your pet is microchipped and has a tag. With more frequent comings-and-goings, it’s easy for your pet to slip out of the house unnoticed. If you’re entertaining, you may wish to keep pets in a quiet room away from the noise and activity. If they’re mingling among the guests, monitor them so that they don’t share the holiday food. Keep your ornaments pet-friendly. Don’t use tinsel on trees, as curious animals are attracted by the shiny strings and may swallow them, which can lead to serious injury. Ornaments hung on lower tree limbs should not be breakable. Keep your tree free of decorations made of food. Barricade the water trough around your tree to prevent your pet from drinking it. The water may be dirty and will contain pine needles. Be careful with Christmas lights. Secure electrical cords and conceal outlets, as pets may chew on cords. Keep pets away from open flames. Some Christmas plants are toxic to pets. Keep your pets away from mistletoe, holly, poinsettias and amaryllis. If eaten, they can cause serious problems. If your pet has eaten something you’re unsure of, call your vet right away. After gifts have been unwrapped, throw away the wrapping paper and ribbons, which can be dangerous for pets. If you don’t know what’s in a package, don’t leave it under the tree. You may find out the hard way that Aunt Jane got you a box of Belgian truffles. Chocolate is toxic for cats and dogs. Holidays are a busy time for visiting — you may be away for extended periods or have a house full of guests. If you’re away, have someone check in on your pet or board your pet. Note that your pet’s vaccinations will have to be up-to-date to be accepted at a boarding facility. Table scraps and left-overs aren’t good for your pets. And, bones in meat can lead to serious complications or death. Ensure that edible food in Christmas stockings are unreachable by your pet. On colder days, limit your dog’s time outside. Cats should live inside all year round. November 26, 2018 — Looking to get a festive family Christmas photo taken this year? Look no further! Santa is coming to the Ottawa Humane Society! Mark your calendars and bring your furry friends and family to have your portrait taken with Santa. Beginning December 1 through 23, Santa Pet Pics will be held at the Ottawa Humane Society (245 West Hunt Club Road) on Saturdays and Sundays from 11 a.m. to 4 p.m. and Wednesday evenings from 5 to 8 p.m.
All proceeds go directly to supporting the animals in the care of the Ottawa Humane Society. For more information about this event, please visit the event webpage at www.ottawahumane.ca/get-involved/special-events/santa-pet-pics/. December 4, 2018 – If your pet goes missing, what are the chances it will find its way home? The Ottawa Humane Society is urging pet owners to take precautions to ensure that if their dog or cat becomes lost, it has the best possible chance of a safe return — by implanting a grain-sized microchip offering permanent, life-long identification. The OHS is holding its eleventh microchip clinic of 2018 on Sunday, Dec. 9 at its 245 West Hunt Club Rd. shelter. When: Sunday, Dec. 9, from 9 a.m. to noon. Cost: $50 for the first pet, $25 for each additional pet. Please note: Pets brought in for a microchip should be in a carrier or on a leash. Owners are asked to bring vaccination records and one piece of ID, such as a driver’s licence. Where: Hosted by the Ottawa Humane Society at 245 West Hunt Club Rd., between Prince of Wales Drive and Merivale Road. Book your appointment today! Call 613-725-3166, ext. 221, or email microchip@ottawahumane.ca. All proceeds benefit the animals at the OHS. For more information, visit www.ottawahumane.ca. The clinic is sponsored by Dr. Shelley Hutchings. Nov. 21, 2018 – The extreme cold forecast for the city tonight means pets left outside too long risk frostbite and even death without shelter from the frigid weather. Ottawa Public Health has issued a frostbite advisory for tonight into tomorrow morning as temperatures are expected to hit as low as -25 C with the wind chill. Cold weather can be as dangerous for animals as it is people. Cats should live indoors year-round and never be allowed to roam in the cold. Limit the time your dog spends outside. Take your dog for shorter, more frequent walks. Consider a sweater or coat for your dog. Be sure to wipe your dog’s paws after returning from a walk to remove salt, sand and other chemicals designed to melt ice and snow. Dogs that live outside are required by law to have an insulated doghouse built from weather-proof material, facing away from prevailing winds. The shelter must be elevated from the ground with a door flap and bedding. Keep an eye on outdoor water bowls. Make sure your pet’s water hasn’t frozen in the cold. Don’t leave your pet in a cold car for a long period of time. Be mindful of animals that may have crawled under your car to keep warm. Bang on the hood a couple times to scare away cats and wildlife. If you see an animal in distress, please call the OHS emergency line at 613-725-1532. November 19, 2018 — Imagine a holiday season where you not only fulfill your children’s holiday wishes but make a homeless animal’s dreams come true too. That’s the idea behind the Ottawa Humane Society’s Holiday Delivery Program, a festive way to surprise a loved one with a furry friend during Hanukkah or on Yuletide morning. From kittens and rabbits to dogs and hamsters, the OHS is seeking families interested in having volunteer elves drop by with their new four-legged family member on Dec. 25 or any night of Hanukkah. Regular adoption procedures still apply, which means parents would come in to the shelter in advance to fill out an application form, be matched with the right pet, and speak with an adoption counsellor. The delivery program is busting the myth that pets should not be adopted during the holidays. If you’ve been thinking about adding a pet to your family, this may be the right time to do it, said Bruce Roney, OHS executive director. “Less travelling, smaller families, and time off during the holiday can make this the perfect time of year to bond with a new pet for many people,” Roney said. There are limited holiday delivery spaces available so contact the OHS soon to sign up by phone at 613-725-3166 ext. 258, or visit the shelter at 245 West Hunt Club Rd. 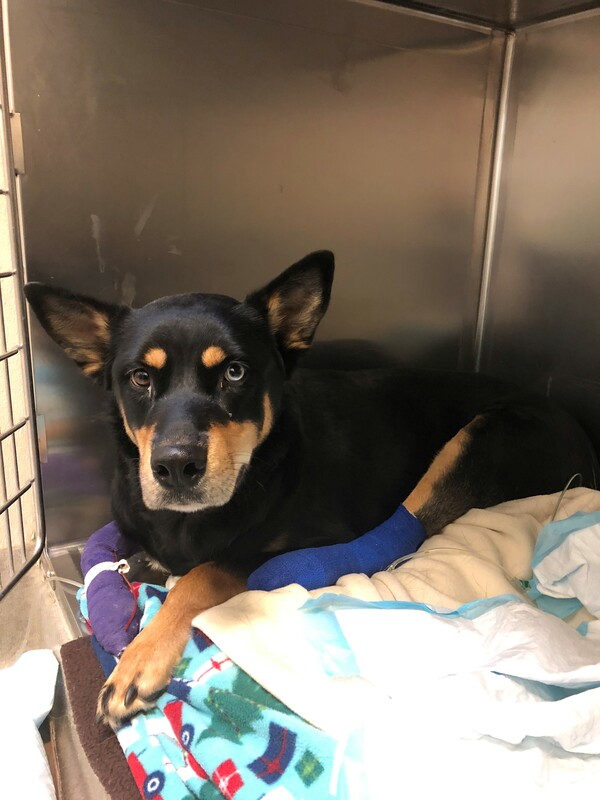 November 14, 2018 — Thanks to the support of the community and local media, the Ottawa Humane Society (OHS) has found the owners of a dog that was hit by a car on Friday. The dog was found by a Good Samaritan on Heron Road near Mooney’s Bay and has been in OHS care since Saturday. The young Rottweiler mix was badly injured and the OHS reached out to the community to find the owners. The dog will be transferred to an emergency clinic this afternoon to continue her care. “We couldn’t be happier that the owners of this sweet dog have been found. We are very grateful to everyone who go the word out.” says OHS CEO Bruce Roney. 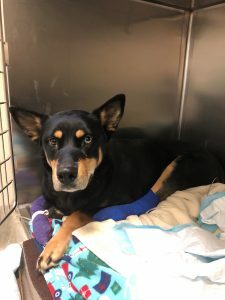 November 13, 2018 – The Ottawa Humane Society (OHS) is seeking the community’s help in finding the owners of a dog that was hit by a car on Friday. The dog was found by a Good Samaritan on Heron Road near Mooney’s Bay. The young female Rottweiler-cross was admitted to Alta Vista animal hospital and transferred to the OHS the next day. OHS veterinarians are providing care, but the dog is severely injured and may not pull through. “This is a young, sweet dog. We would really like to reunite her with her family, but with no identification and no lost report, we have been unable to locate her owners,” says OHS CEO Bruce Roney. The owners or anyone having information about the owners should contact the OHS Lost and Found Department at 613-725-9998 or intake@ottawahumane.ca. Get ready to howl for Howl-O-Ween at the OHS! October 25, 2018 – Looking for something fun to do this Saturday, October 27? Put on your costumes and come to the OHS Education Centre at 245 West Hunt Club Road between 11 a.m. and 1:30 p.m. for some spooktacular free family fun! Parents and children will have a great time participating in Halloween-themed activities such as a scavenger hunt, photo booth, crafts, sweet treats, and of course visits with the animals! For more information about this event you may visit the OHS Howl-O-Ween webpage, or contact our supervisor: programs at (613) 725- 3166, ext. 298 or programs@ottawahumane.ca. 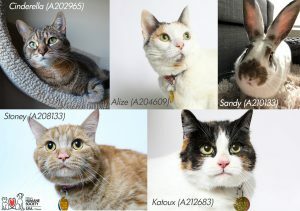 September 27, 2018 – This weekend, the Ottawa Humane Society (OHS) is hosting an adoptathon with one of its Pet Adoption Location (PAL) partners, Pet Valu on Merivale Road, featuring among other animals, four beautiful cats and one charming rabbit that are currently living in temporary foster care and in desperate need of a permanent home. “Sandy the rabbit, and her four cat friends Cinderella, Alize, Stoney and Katoux have been living in temporary foster care for quite some time now, waiting patiently for their forever home,” said Bruce Roney, OHS President and CEO. An animal who lives with a loving foster family is for the most part, a pet with special needs. Cats like Cinderella, who have been available for adoption for more than a year, needs a prescription diet to help her stay healthy. Finding a permanent home for Cinderella means finding an owner who will commit to supporting her special needs. Cinderella and Katoux: Saturday September 29 from 11 a.m. to 3 p.m.
Stoney and Alize: Sunday, September 30 from 11 a.m. to 3 p.m.
September 26, 2018 – The Ottawa Humane Society (OHS) received an incredible donation from Hill’s Pet Nutrition Canada to help feed the cats and dogs of families living in the areas most affected by Friday’s tornadoes. OHS staff left at 10 a.m. today to deliver the pet food to the Dunrobin Veterinary Clinic, the March Road Veterinary Clinic, the Western Ottawa Community Resource Centre, and the Trend-Arlington Community Centre. Members of these communities are encouraged to contact the locations directly to access the food. “Pets are our family members and they need to eat too,” said Roney. 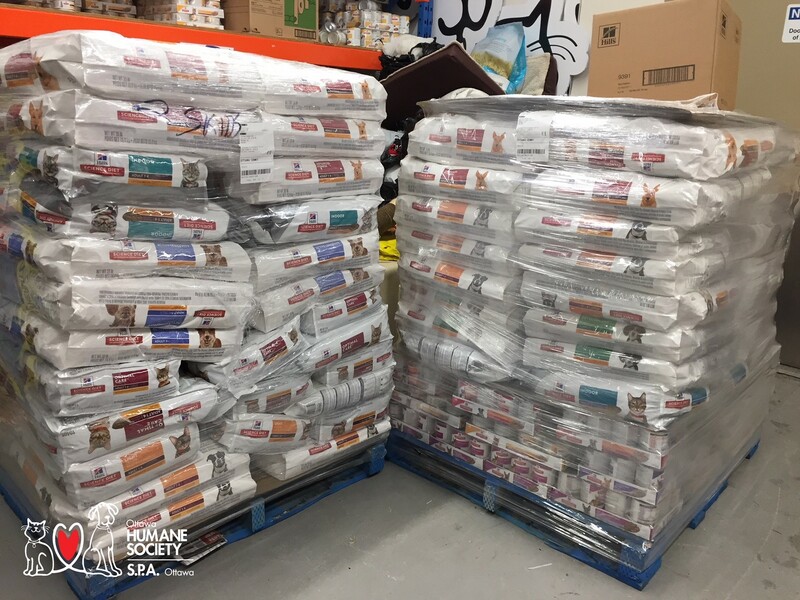 We’re delighted to help distribute this pet food to community members having limited access to resources as a result of a tornado touching down in their neighbourhoods.” added Roney. The OHS welcomes any found pets that may have been displaced as a result of the tornadoes. OHS staff and volunteers are here to help reunite displaced pets with their owners. Contact us at 613-725-9998 or intake@ottawahumane.ca. The OHS will continue to ensure Ottawa’s animals are provided with the care they need following this tornado tragedy. September 24, 2018 – Ottawa Humane Society (OHS) on West Hunt Club Road experienced a 48 hour power outage and sustained minor damage to its shelter, as a result of last Friday’s tornados. “When the shelter lost power, we immediately went into emergency response mode,” said Bruce Roney, OHS President and CEO. “All animals, visiting public, OHS volunteers and staff were gathered indoors to ride out the storm, and we are happy to report no one was hurt,” added Roney. The OHS had more than 300 animals in its care on Friday when the storm hit. Over the weekend, the shelter was closed to the public, with the exception of Admissions and Claiming. Devoted animal care attendants remained onsite, working additional hours to care for the animals in partial darkness. The shelter was operating by way of an emergency back-up generator, which had to be refuelled twice to sustain the shelter’s essential needs such as lights, refrigeration of medical supplies and lifesaving medical equipment. Because the OHS was not operating at full power, staff were unable to operate the washers and dryers, and quickly ran out of clean towels and blankets for the animals. Other supplies that could not be sterilized depleted quickly. “While the outage luckily had no effect on the animal’s well-being, the cost of making the shelter functional again will top several thousand dollars and we are reaching out to our community members for clean towels or blankets, and financial donations,” said Roney. Please visit www.ottawahumane.ca/tornado today to contribute. Ottawa’s animals need your help. September 20, 2018 – Earlier this week, Ottawa Humane Society (OHS) volunteers and staff welcomed 22 Northern animals into its shelter. Five kittens, eight cats, seven dogs and two puppies, arrived on Monday afternoon from the Obedjiwan reserve, a First Nation community in Northern Quebec. “Although tired from their journey, the dogs greeted us with wagging tails and the cats with loud purrs,” said Bruce Roney, OHS President and CEO. “These animals are well socialized from living among people on the reserve, but with limited veterinary services and resources for animals in Canada’s northern communities, many of these homeless animals and others like them, are left unsterilized, without food, or groomed for that matter,” added Roney. All 22 animals are receiving the medical attention they need to prepare them for adoption. This week, OHS clinic staff are focusing on providing the animals with flea treatments, vaccines, deworming, microchipping, spaying and neutering. “At the OHS, we believe it is our responsibility to help animals in jurisdictions that are facing this reality. OHS clinic staff are working hard to make sure each of these animals are being provided with appropriate and immediate care,” said Roney. The OHS is reaching out to members of the community to help this band of northern beauties get the second chance they deserve. The combined balance due for their care is expected to be more than $6,000. They need your help. Please visit the Northern Pets donation page today to help contribute to the cost of their care. Sept. 11, 2018 – If your pet goes missing, what are the chances it will find its way home? The Ottawa Humane Society is urging pet owners to take precautions to ensure that if their dog or cat becomes lost, it has the best possible chance of a safe return — by implanting a grain-sized microchip offering permanent, life-long identification. The OHS is holding its eighth microchip clinic of 2018 on Sunday, Sept. 16 at its 245 West Hunt Club Rd. shelter. When: Sunday, Sept. 16, from 9 a.m. to noon. 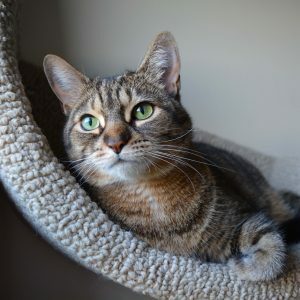 August 24, 2018 – The Ottawa Humane Society (OHS) announced yesterday that its kitty crisis has stabilized after Ottawa residents adopted a record breaking 308 cats in the past three weeks. Now the OHS is opening their doors to provide shelter and forever homes for 60 cats in deep crisis at the Windsor and Essex Humane Society. To facilitate the transfer, Lincoln County Humane Society (LCHS) is using their mobile pet adoption vehicle to make the trek from Windsor to Ottawa with the cats. LCHS Executive Director, Kevin Strooband will be driving the vehicle all weekend to help these felines. Most of the cats will come directly from Windsor to Ottawa, with a few being dropped off at Pickering Animal Services along the way. Melanie Coulter, LL.B, J.D., M.Sc. August 15, 2018 – The Ottawa Humane Society (OHS) wants to thank all of the people who came out to adopt cats over the past two weeks. Forever homes were found for 184 cats. Sadly, in the same period, the OHS admitted another 153 cats into their care. “We had an amazing response. Many cats now have homes, but our need for adopters and donor support continues,” said Bruce Roney, OHS President and CEO. There are still many cats in need of a home: a total of 420 as of today. The OHS currently has 78 adult cats and 8 kittens ready for their forever home. “During the summer months, we receive what seems like a never-ending cycle of homeless, injured and sick cats that need our help. We welcome each and every one of them and will do everything we can to ensure they are healthy and find a home, but we need the support of our community to do this,” said Roney. If this is not the right time to adopt a cat, our community can help by becoming a foster volunteer or support the animals in the care of the OHS by becoming a virtual foster parent. More information about becoming a virtual foster parent is available on the OHS Purrfect Pairings webpage. August 10, 2018 – The Ottawa Humane Society (OHS) has partnered with two Ottawa Nissan dealerships to help support Ottawa’s homeless, sick and injured animals. Ottawa Nissan’s “Dog Days of Summer Campaign” is already in full force at Hunt Club Nissan and 417 Nissan. Both dealerships will donate $50 for every used vehicle and $100 for every new vehicle sold during the month of August. The idea of a fundraising partnership was introduced by the shelter’s business neighbour Hussein Habbal, General Manager at Hunt Club Nissan. Nissan’s enthusiasm for supporting Ottawa’s vulnerable animals’ goes hand-in-hand with OHS safety tips for travelling with your pet, and a very important OHS awareness campaign called Dogs Die in Hot Cars. If you are looking to buy a new or used vehicle, visit the Hunt Club Nissan or 417 Nissan dealerships today and help an animal in need! June 28, 2018 – The Ottawa Humane Society is preparing for its busiest and perhaps most dangerous long weekend of the year. Booming fireworks coupled with a severe heat advisory have the makings of a perfect pet storm. “Fireworks can be terrifying to most animals. Even a calm, predictable dog can panic and bolt,” said Bruce Roney, OHS President and CEO. Dozens of pets become lost or injured each year because they are spooked by fireworks. Dogs in particular fill the OHS shelter in what continues to be an unfortunate holiday tradition. Fireworks aren’t the only concern. A severe heat advisory was recently issued by Environment Canada. “A heat wave can create many additional and critical concerns for all pets such as heat exhaustion and dehydration. What is most concerning is the reality that pets continue to be left unattended in a locked vehicle, and during a heat wave this cruel act can have fatal consequences,” said Roney. Keeping fireworks and severe heat in mind, best to keep your pet indoors with plenty of drinking water. If they must go outside, again ensure they have shade, plenty of water, and protect their paws from scorching hot pavement. Become aware, like and share the OHS summer pet safety tips, and if you see an animal locked in a vehicle immediately call the Ottawa Police at 911. June 5, 2018 – If your pet goes missing, what are the chances it will find its way home? The Ottawa Humane Society is urging pet owners to take precautions to ensure that if their dog or cat becomes lost, it has the best possible chance of a safe return — by implanting a grain-sized microchip offering permanent, life-long identification. The OHS is holding its fifth microchip clinic of 2018 on Sunday, June 10 at its 245 West Hunt Club Rd. shelter. When: Sunday, June 10, from 9 a.m. to noon. May 25, 2018 – The 30 young cats that were brought to the Ottawa Humane Society shelter yesterday by staff of a local pest control company have now been assessed by OHS veterinary staff. Several of the kittens are now believed to be considerably younger than originally thought. Some of the other kittens are suffering dehydration and are now on intravenous fluids. Some have diarrhea. So far, OHS staff believe both symptoms of being left in crates in the hot sun. The older juveniles are showing no ill-effect. The cats continue to be isolated from other felines at the shelter. Shelter staff are still hoping to move the older cats through to adoption quickly as the shelter becomes more crowded daily. The pest control company brought the cats to the OHS on Thursday, reporting that the cats had been left in two cardboard boxes and two dog crates on their property. All the cats are young, some are kittens and some older juveniles. The OHS is appealing for help to rescue these vulnerable felines. To help, please visit: ottawahumane.ca/30kittens. The Ottawa Humane Society is a registered charity founded in 1888. To lead Ottawa in building a humane and compassionate community for all animals. May 25, 2018 – Thirty young cats were brought to the Ottawa Humane Society shelter yesterday by staff of a local pest control company. The company reported that the cats had been left in two cardboard boxes and two dog crates on their property. All the cats are young, some are kittens and some older juveniles. Most appear in good health and all are socialized. The cats are isolated from other felines at the shelter and OHS staff are scrambling to get all of them vaccinated and medically assessed. OHS staff were alarmed that one appeared sick, and hoped it was nothing that could affect the other 29. In the end, the kitten was diagnosed as motion or heat sickness. During the busy summer months, the OHS can see 35 or more animals admitted daily in need of care. The OHS appeals to the community in the spring and summer months to help it care for the huge increase in pets, especially cats, needing housing and care. To help these little cats, please visit: ottawahumane.ca/30kittens. If your pet goes missing, what are the chances it will find its way home? The Ottawa Humane Society is urging pet owners to take precautions to ensure that if their dog or cat becomes lost, it has the best possible chance of a safe return — by implanting a grain-sized microchip offering permanent, life-long identification. The OHS is holding its second microchip clinic of 2018 on Sunday, April 8 at its 245 West Hunt Club Rd. shelter. When: Sunday, April 8, from 9 a.m. to noon. Celebrate A Hoppy Easter With the Animals This Sunday at the Ottawa Humane Society! There really are no egg-scuses for missing the annual Hoppy Easter family event at the OHS! Hip hop your way to the shelter for some free family fun on Saturday, Mar. 24 between 11 a.m. to 1:30 p.m.
For more information about this event, please visit our event website, or contact our supervisor: programs by email at programs@ottawahumane.ca or by phone at (613) 725-3166, ext. 298. The OHS is holding its second microchip clinic of 2018 on Sunday, March 11 at its 245 West Hunt Club Rd. shelter. When: Sunday, March 11, from 9 a.m. to noon. Join us for National Cupcake Day 2018 and really bake a difference for Ottawa’s animals! This winter bake cupcakes, raise funds and help Ottawa’s innocent animals! Monday, February 26, 2018 is National Cupcake Day – one of the biggest fundraisers of the year for us at the Ottawa Humane Society. The concept is simple: a host baker signs up to bake a difference by fundraising and collecting donations from family, friends and co-workers. On February 26, the baker hosts a National Cupcake Day event at their home, school or workplace where they supply delicious cupcakes in exchange for donations to the OHS. Go that extra doggy mile – top individual and fundraising teams are eligible for some great prizes! It’s really that easy! Together with your help we can make Monday, February 26 the most purr-fect day of the year for Ottawa’s animals! Feb. 22, 2018 — With this week’s mild temperatures it may seem like spring is finally in sight, however, three cats at the OHS right now highlight the dangers the outdoors continue pose to cats in our community. Storm, Misty and Sky were found huddled together under a dumpster. Storm’s tail was frozen to the ice. They’re all now safe and warm, resting at the OHS. Thankfully Storm’s tail did not have frostbite, a fate that befalls many cats abandoned in the cold. Soon they’ll be spayed or neutered and ready to find their forever homes. What can you do to help the cats in our community? Never let a cat outside unsupervised. Securely screen or close windows. If you can no longer care for your cat, bring them to the OHS rather than letting them out in the cold. If you find a stray or injured cat, call City of Ottawa Bylaw at 311 or bring it directly to the shelter at 245 West Hunt Club Rd. Jan. 9, 2018 – If your pet goes missing, what are the chances it will find its way home? The Ottawa Humane Society is urging pet owners to take precautions to ensure that if their dog or cat becomes lost, it has the best possible chance of a safe return — by implanting a grain-sized microchip offering permanent, life-long identification. The OHS is holding its first microchip clinic of 2018 on Sunday, Jan. 14 at its 245 West Hunt Club Rd. shelter. When: Sunday, Jan. 14, from 9 a.m. to noon. Jan. 2, 2018 – We have an update on some changes coming to the way the Ottawa Humane Society operates in our community. The first is that City of Ottawa Bylaw Services will be transporting injured stray domestic pets and wildlife effective January 5, 2018, rather than OHS. As of that date, Ottawa residents should call 311 for help with injured stray animals and wildlife. Animals will continue to be brought to the OHS for care. This significant change will be better for the animals. It will cut down on the confusion in our community we saw this past year about who to call if an animal needs emergency transportation to the OHS. It will reduce an inefficient system, so that we can focus efforts on what will do more for animals. The OHS has been the provider of municipal animal sheltering services for the city for many decades. This realignment in services will be an extension of the strong relationship the OHS has enjoyed with the municipality. Our first priority has always been, and will continue to be, the animals in our community. The OHS will continue its work rescuing animals once they arrive at the shelter, with lifesaving veterinary care, food and shelter. We will continue to work with our partners in wildlife rehabilitation to save as many injured wild animals as possible. The second change is that we will be increasing our intervention with dogs with behaviour issues, to help more of them find new homes. And, we will work more on advocacy, championing animal welfare for our community. Planning is underway to identify the resources available and the models to use to achieve both goals. Investment in both is expected in our new fiscal year in April. These changes stem in part from incidents in 2016. You may recall that year, we spoke up when the OSPCA tried to take away the voice of our community — your voice — in animal welfare by taking away our voting rights. We joined six other humane societies in court to get back your vote. The OSPCA responded by stripping our officers of their power to investigate animal cruelty. Late last fall, a judge dismissed our case. Obviously we don’t agree with the outcome, but for the good of the animals, we will not be pursuing an appeal but will be focusing on ensuring a better future for Ottawa’s animals.